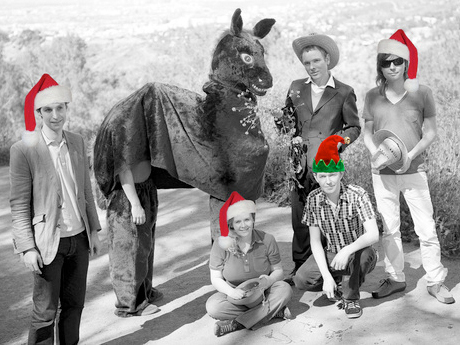 Belle and Sebastian to Stream Their "Holiday Spectacular"
Twee poppers Belle and Sebastian need to take a bit of a break. The Glaswegian outfit have, of course, been on the go since the early fall release of their latest record Write About Love. Before the band retire for the holiday season, though, they will play one last pre-Christmas gig, and lucky us, it will be broadcast live for everyone to see. A post on the B&S website explains that next Tuesday's (December 21) performance at Glasgow venue the Barrowland will be streamed live in its entirety on NPR at 4 p.m. EST. Though we will have to wait until Tuesday to find out what songs they've selected for the last B&S concert, which they are dubbing their "Holiday Spectacular," chances are good that they will mix it up between back catalogue classics and the occasional yuletide number. After all, NPR says, the group "promise to dig deep in the band's archives to play a mix of old favourites and lost gems, along with a few festive surprises." In the spirit of the season, here's hoping they dust off winter weather-related chestnut "Fox in the Snow," and maybe another rendition of "O Come All Ye Faithful," which the troupe performed years ago on a John Peel session.